At the end of 2018, MBDA successfully demonstrated the use of the Mistral missile against fast boats such as FIACs (Fast Inshore Attack Craft). 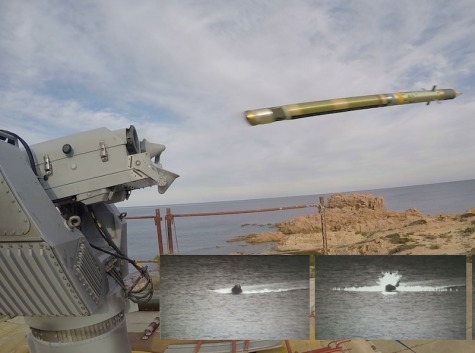 A number of foreign delegations attended the demonstration firing that was performed from a SIMBAD-RC automated naval turret firing from the land against a fast moving remotely-controlled semi-rigid boat more than 3 kilometres off the coast. The scenario was intended to be representative of the self-protection of a vessel against an asymmetric threat (commando or terrorist attack). In its latest version currently in service with the French armed forces, the Mistral is an air defence missile equipped with an imaging infrared seeker with advanced image processing capabilities that allow it to engage low thermal signature targets from a long distance (such targets include UAVs, missiles and fast boats), whilst at the same time offering excellent resistance to countermeasures. The SIMBAD-RC is a remotely-controlled very short range naval air defence system that provides highly efficient capacities against a wide range of threats, from combat aircraft through anti-ship missiles to small-sized threats such as UAVs. The system is easy to install and thus provides small units or support vessels with a true self-defence capacity, or can even ensure reinforced defence for the other types of surface vessels. Each turret supports two ready-to-fire Mistral missiles. The turret is remotely-operated, allowing the operator to remain under cover in the vessel’s operation centre, and thus ensures longer operational availability in case of a combat alert. “MBDA is constantly striving to help armed forces make optimum use of their investments in our products”, said MBDA CEO Antoine Bouvier. “The demonstration of the SIMBAD-RC Mistral combination against surface targets reflects our policy of giving our systems additional capacities to supplement those they were originally designed to provide”. With a significant presence in five European countries and within the USA, in 2017 MBDA achieved a revenue of 3.1 billion euros with an order book of 16.8 billion euros. With more than 90 armed forces customers in the world, MBDA is a world leader in missiles and missile systems. MBDA is jointly held by Airbus (37.5%), BAE Systems (37.5%), and Leonardo (25%).